I am very fond of politics and sad at the state our nation is in related to politics at the same time. I know I am terribly, terribly liberal and I feel that the Democratic party is too moderate for my tastes. I don’t feel like there are real choices in our political system and it’s a choice of voting for who is pandering most effectively. That is not what this post is about though. I feel that I need to give fair warning where I stand politically though because these issues have somehow been wrapped up in Republican vs. Democrat debates and good solid science is just left to the winds. Each person enters into this debate with different emotional afflictions though and I can’t say that I am not. I’m frustrated at the farm bills. I’m frustrated because with my limited understanding of them, it seems that they support all the wrong kinds of farming. We subsidize foods that are not the most nutritious, but are fillers. There are other problems, but I don’t want to belabor my point. I have a degree in plant and soil science from SIU-C. My focus was horticulture and landscape design, I don’t want to misrepresent myself. Part of my program however was to take courses that covered the scope of American farming. Crop sciences, Agricultural economics, etc. I did an externship at a seed supplier who distributed seed to rural farmers in Illinois. My father worked for my grandfather on the family farm when I was little. I worshipped the two of them and even at such a young age would love to sit and listen to the men talk about how they were running the farm. My grandfather always brought people home for meals and distributed Badger equipment and Purina feeds. I remember sitting at the back of the family room during some kind of meeting about pork production and raising hogs on concrete pads. I loved the farm and that love of working with food stayed with me. My brother owns that farm and that family room now and I am constantly amazed at his stamina in working full time, having four kids, and producing some of the most delicious meat I’ve ever tasted. 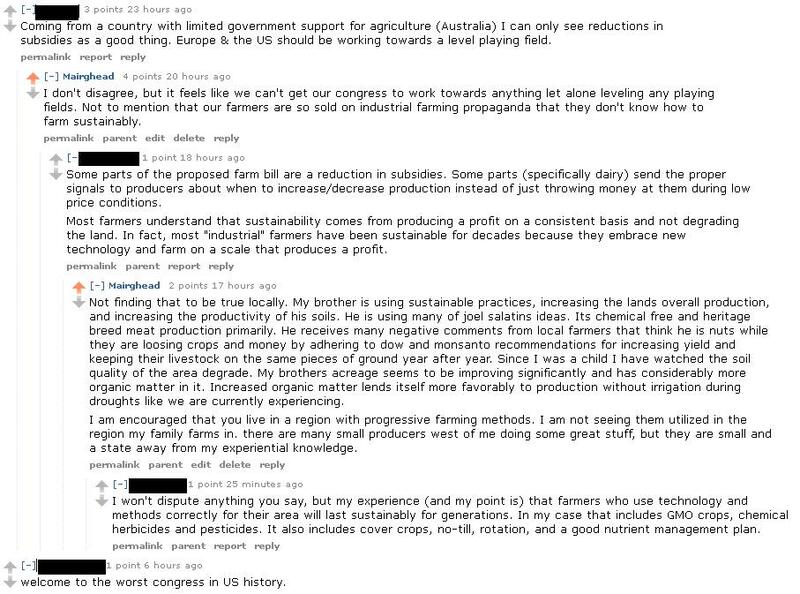 The above article lead me to respond in a sarcastic manner about our congress and the influence that big farming has over our nations farmers. I remember watching commercials during the evening news from my grandmothers bed on all sorts of herbicides and other chemicals playing over and over and over again. I never questioned the necessity of them. The indoctrination started as far back as I can remember. 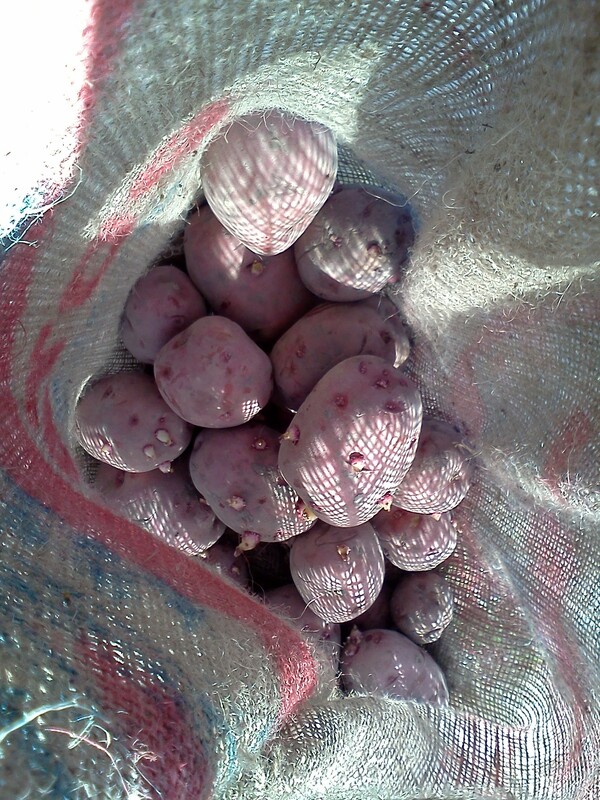 I went through my externship never questioning the seed production in our country. I watched signs go up on test plots in the country and thought those test plots represented real progress in my lifetime. Then I went to work. I got my chemical applicators license and sincerely believed that Round Up was so harmless that you could probably drink it. One of my coworkers accidentally drenched his clothing in it and kept working, by the end of the day he was silly and hallucinating and we all thought it was a funny incident and terribly harmless. I hate to think of the long term effects of that. 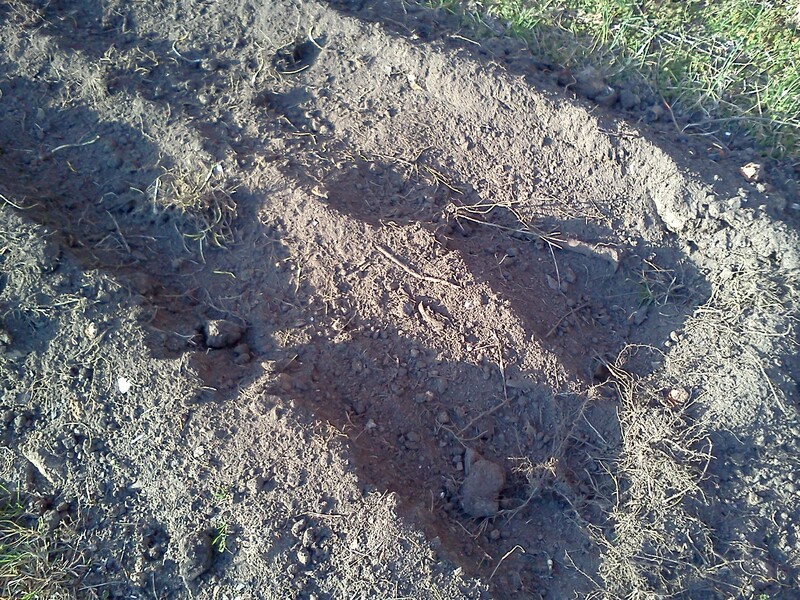 I dutifully went out and sprayed peoples landscaping beds and trees with who knows what. No mask. Long sleeves, long pants, but breathing it all in as I sprayed above me. I thought the chemicals were a god send. It saved so much on labor. I could make so many people have pristine yards. I watched my now husband spray all sorts of crazy chemicals on things. He is still breathing in who knows what to this day. He is now an IronWorker and builds things like oil refineries. Soon, he will be leaving to Canada to work on the pipeline coming through Alberta. We all get up and go to work and do what we need to do to get by, but sometimes I think it deadens us to what is going on around us. Should my husband go build a pipeline and support big oil? Ethically, probably not, but that is a hard decision to make when you have bills to pay and children to feed. It’s difficult to gain perspective and see what is actually happening around you and try new things. You want your time to be most effective at meeting your needs and it is easy to walk willingly into bad ideas that are seemingly cost effective at the time. Take Round Up ready corn for example. This is the product that started to open my eyes. One thing I learned in college was that nature constantly changes and adapts. I’ve used Round Up, I’ve watched certain weeds in certain yards get harder and harder to kill after multiple applications. I could see that weed seeds that resisted the Round Up survived my applications and inevitably, nature would find a work around if I kept it up. Then Round Up Ready Corn hit the market and it was a wake up call to me. I couldn’t understand how that could work. Nature would adapt. It seemed entirely obvious. That was a while back, now we see this from two years ago: Farmers Cope With Roundup-Resistant Weeds. Have we done anything with this knowledge? Why, yes: Losing the War on Weeds. 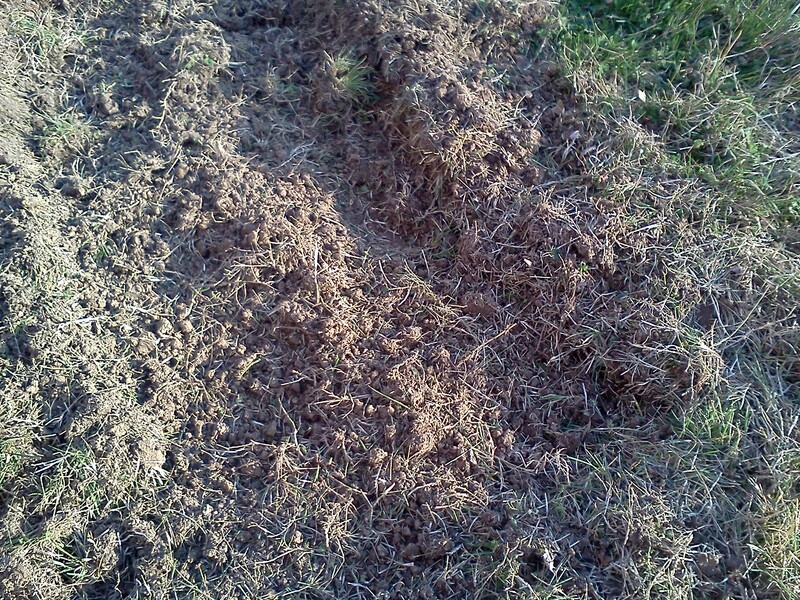 We are often choosing to go back to tilling, more chemicals, and other practices that roundup ready was supposed to save us from. I don’t see how things have really changed, we just keep reinventing a type of farming that isn’t proving to be viable. My sarcastic comment was responded to by and earnest and hard working farmer. I don’t want to belittle him. He is doing what he feels is right and trying to do best by his land and his family. The problem that I see here and was commenting about in my first comment is that sometimes, salespeople and culture get into our heads and undermine what we think we know. This man would not intentionally harm his land, he wouldn’t hurt his profits, and he wouldn’t try to harm anyone around him. The frustration for me comes in that we are not speaking the same language. Part of landscaping and really the majority of my career has been sales. I’ve been to so much sales training it’s not even funny. There are so many seminars out there to teach you how to use vocabulary and perks to sell anything. Part of the main goal of most is to emphasize what the product will do for you. Save time, save money, increase comfort. This process of sales develops a vocabulary with your customers. Your customers learn this vocabulary and use it with each other. They then become in the know and it increases the difficulty of discussions with folks outside your normal parameters. My definition: Utilizing nature’s own mechanisms for control of pests and invasive weeds without the use of fossil fuels or other limited quantity substances. Here is Wikipedia’s take on Sustainable Agriculture. I really like what it says there. I suspect the other guy wouldn’t disagree too much with it either. We have commonalities in our goals. I want to make money at farming. 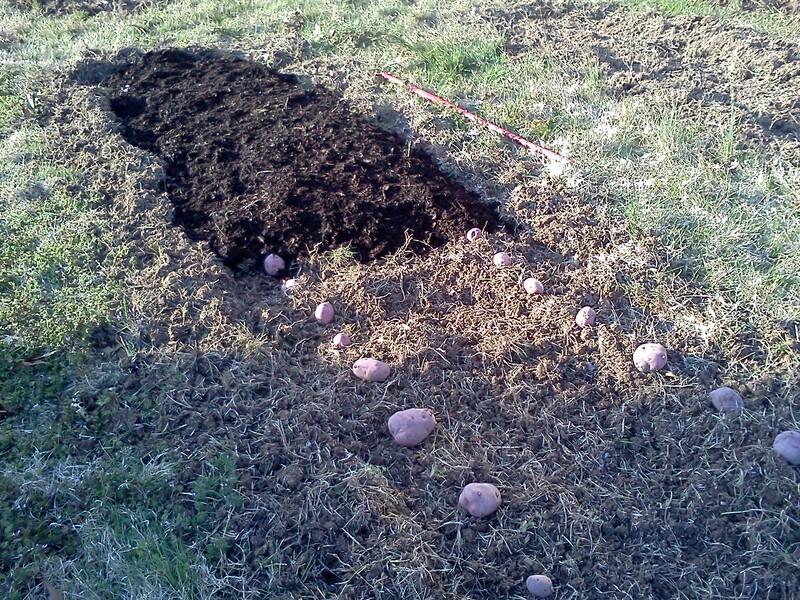 I want to improve my soils and provide for my children. I’m choosing a vastly different path. Our beliefs about this definition don’t come from our politics necessarily, but the same mechanism has created a gulf in our vocabulary that makes it difficult for our minds to meet. How do we bridge this gap as a nation or as just humans and work past it to make a better world with better soil? We all want to feed people, we all want to provide. We are the nurturers and the farmers and the keepers of this earth. How do we bridge the divide in our current culture? I find this a monumental and sad question that I have no answers for. 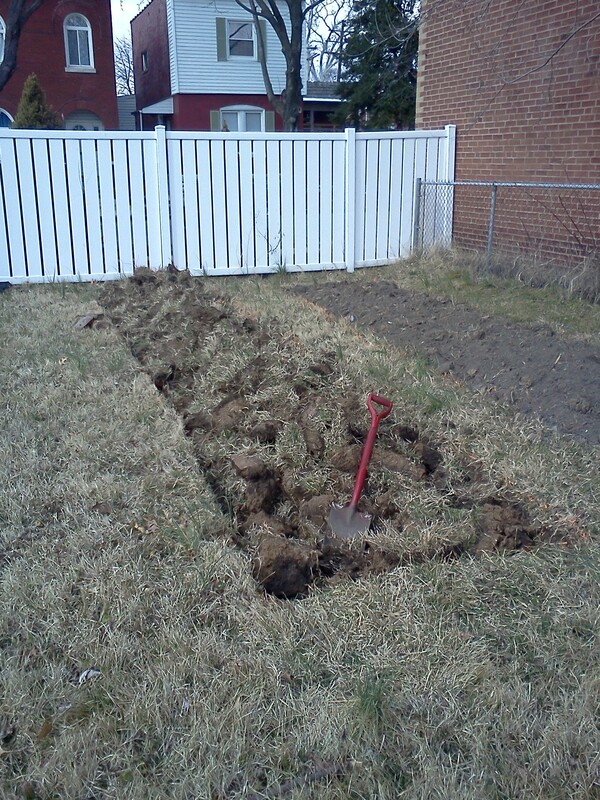 How long does it take to dig a garden bed? 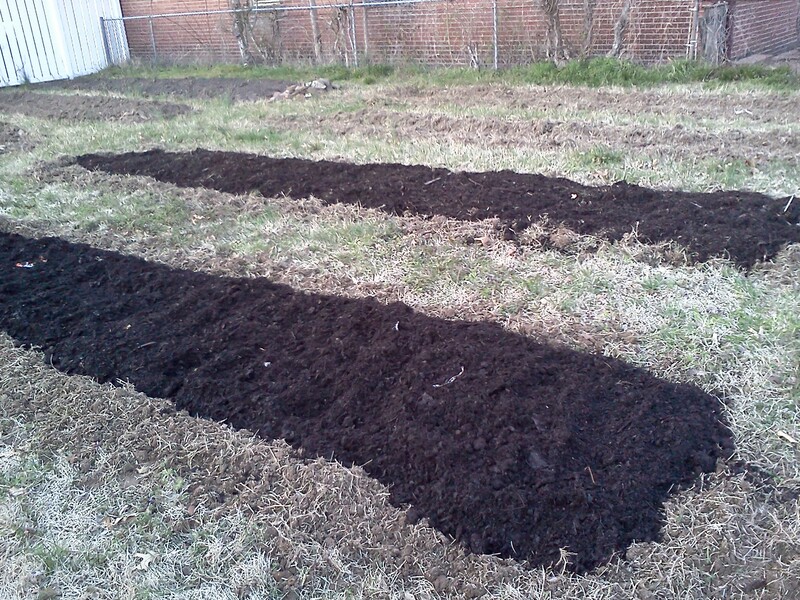 One pass on one 4 x 20′ bed with one shovel is…… one hour and 15 minutes. This is with picking out bricks and rocks and pottery and bottles. Also figure in time for occasional day dreaming. 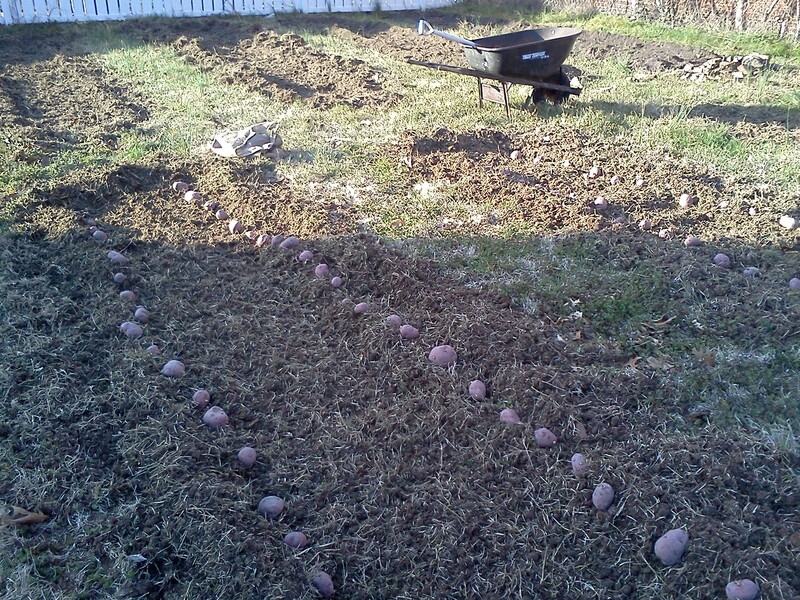 I think an hour would be a reasonable amount of time to figure in if you don’t have hard clay soil or brush. I will let that air for a couple of days, then go back and do the next pass. The next pass on this particular ground will have a lot more bricks and building debris in it than the first pass, so it will probably take me two hours. 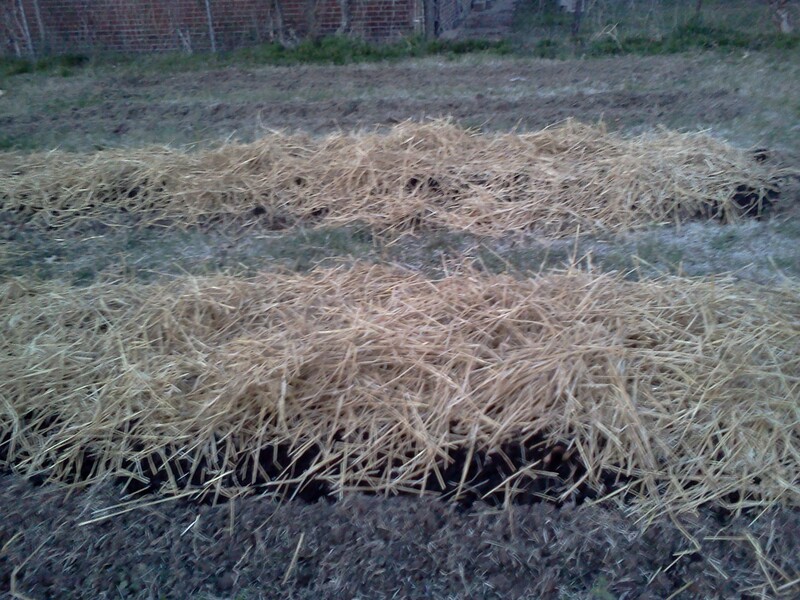 When I am done, it will look like the bed on the right and be ready for a layer of straw mulch. I am a total fan of turkens. I’ve never had a bad one. 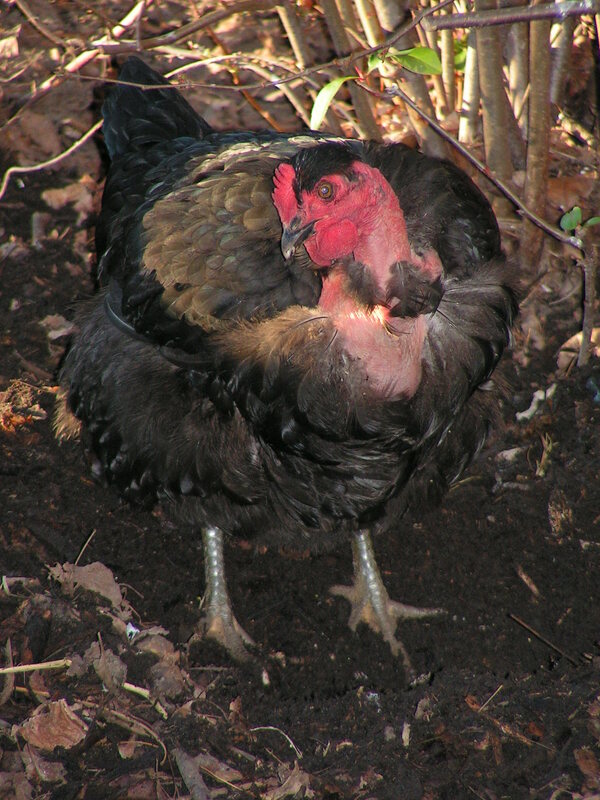 This breed is ugly, but seemingly perfect for urban agriculture. They tolerate confinement, eat very little, can’t fly, and are very friendly. This year I have had Red Star, White Rock, Red Rock, Black Aurucana, one silver lace wyandotte bantam and Saipan Jungle Fowl in addition to turkens of many colors. Today my partner in garden inspiration, Heather and I ordered our chicks for this year. I think the plan we just came up with is 8 turkens, 3 white rocks, 5 red caps, 3 feather footed for the neighbor, 3 lakenvelters, and 3 black minorcas. The second coop is open and I’m not sure when the delivery date will be. I have to think about where I want to put it while they are growing, it’s more appropriately called a chicken tractor. I may have time to do some renovations, may not. The turkens lay daily never skipping a day. They start out with fairly large eggs and within a week or two are regularly laying large grade eggs. I’ve had really good luck with White Rocks and the Aurucanas as well. Good reliable layers. I won’t be able to tell the difference in feed with this batch since I’m putting them all together. I know from past experience however that the Turkens eat far less than other breeds. Very cost effective and they make good meat as well. Excellent dual purpose breed and a joy to own.